The cooler weather in Los Angeles has been absolutely amazing. Feeling the cool breeze against my skin honestly puts a smile on my face. Though lately it has been even colder than I imagined. But knowing how LA weather is, it will more than likely warm up a little bit here and there. –– So here is one of my favorite looks for this season! Okay before you guys saying anything, I know... I look kind of "peasant" like. But hey, it's at least a trendy looking peasant, right? I've really been loving these button-up skirts that have been trending lately. I did a previous post wearing a black one, but I honestly much prefer this camel colored one I found at Brandy! The fit of this skirt is so much better on my body than the one I bought at Forever 21. It sits perfectly on my waist and what I love most is that it flares out as well. My shoulders are a bit broader than my hips so sometimes when I wear very tight fitting bottoms, my body looks a bit disproportioned. To give my hips a little bit more oomph, skirts that flare out are ideal for me. I decided to pair it with this white off-the-shoulder top because I absolutely love the contrast of the white and camel. And since it's also cropped, it falls perfectly above my skirt. Originally, I wanted to wear black over-the-knee boots. But at the time I didn't have a pair so I decided to just pair my ankle booties with black thigh high socks! 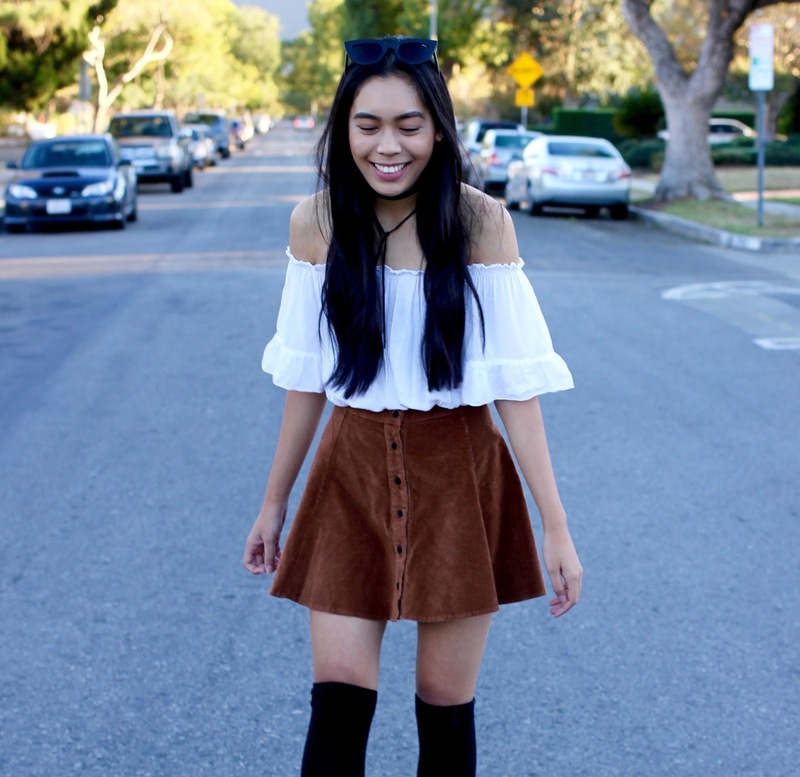 It definitely gives the illusion of over-the-knee boots if you're on a budget!